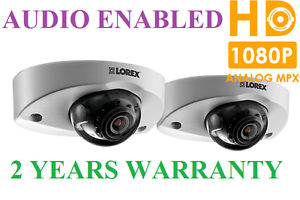 Protect your property with confidence by purchasing this complete 2K surveillance solution from Lorex. 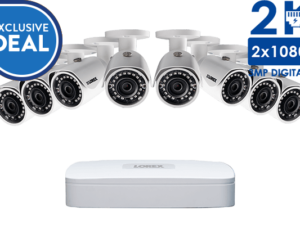 The web exclusive LN2K-321414D security system features our exclusive 4K-ready 32-channel NR900 network video recorder (NVR). 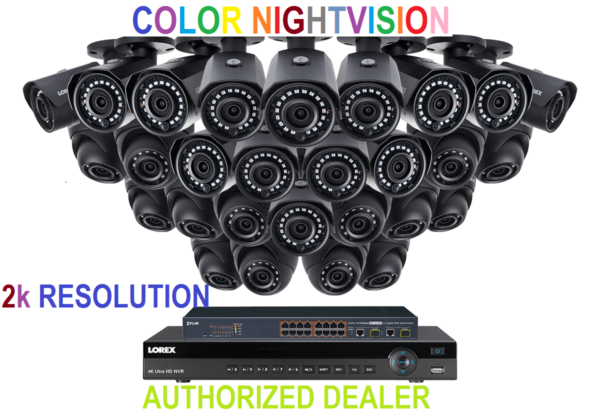 It also comes with fourteen 2K bullet and fourteen dome network security cameras, with outstanding color night vision capabilities. The HDIP1688D will leave nothing to question with detailed and crystal clear security video. The 4-megapixel image sensors in both sets of cameras are capable of recording stunning 2K resolution footage. They also contain wide 90° angle lenses for broad fields of view that will help you see more. Give yourself the best chance to capture the details you need. 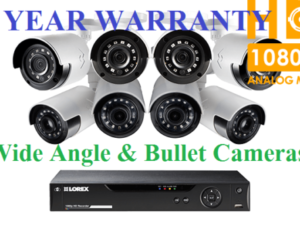 2K security cameras record in a much higher resolution compared to 1080p and will provide you with sharper video. This additional resolution is especially useful if you need to zoom in on distant objects when analyzing footage. IP security systems such as this can handle recording at high frame rates. A high frame rate will deliver smooth on-screen movement during live-views and playback and can help you capture the best moments if you ever need to provide a snapshot for evidence. This is simply because there are more frames available to choose from. This system can record 2K footage at 20 frames per second (FPS) or record at a real-time 30 FPS in 1080p HD. Lighting conditions are rarely the same throught the camera’s entire field of view. Some sections might be too bright, while other sections might be too dark. Thankfully, your cameras use an HDR (High Dynamic Range) feature that takes the difference between these dark and light areas and automatically adjusts the brightness so no area is too over-exposed or too dark to see details. This results in optimized security video in all lighting conditions. Noise is a common attribute of video in low-light settings. This is essentially the camera’s image sensor artificially boosting light levels so it can pick up details and distinguish different colors and contrast. This is not a big problem for your security cameras, however. They come with a DNR (Digital Noise Reduction) feature that is used to filter out this noise from low-light settings, as well as any noise caused by motion. This provides you with a cleaner, more accurate image with better clarity, sharpness, and improved motion detection. It will also help reduce video file sizes as well, which will save you storage space on your NVR. 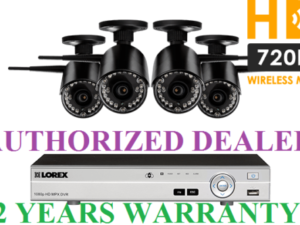 A do-it-yourself security camera company, Lorex is proud to offer security systems that feature an easy installation process. The HDIP1688D is no exception. Power-over-Ethernet (PoE) technology is an all-in-one solution that cuts cost and installation time. A single cable run between your NVR and each IP camera provides both power and video transmission up to 300 feet / 91m click here to purchase extension cables. A system like the HDIP1644MD can also incorporate a PoE switch, allowing you to minimize the amount of cabling required for larger properties. Your security system will always be at your fingertips with the help of our FLIR Secure™ app. Securely view your security cameras from virtually anywhere in the world using your mobile device. This app will also keep track of all motion activity with easy-to-read timelines and send you push notifications and / or instant email alerts for motion-triggered events. The FLIR Secure web viewing portal is also available for PC and Mac personal computers. Manufactured with an IP66 weatherproof rating, the security cameras in this system are suitable for both indoor and outdoor installation. Whether in a torrential downpour or a furious snowstorm, your security cameras can persevere. Heavy-duty (yet durable) metal housings and vandal resistant designs makes these security cameras a dependable choice for year round security that never stops working. Their corrosion-resistant aluminum bodies also make them for perfect outdoor use, protecting them from even the harshest of weather – including rain, snow, or even hail. Rely on the 6TB security certified hard drive to safely store weeks (or even months) of security footage. It is designed to operate continuously and can withstand the heat fluctuations in your NVR without crashing. For longer record times, you can choose to record at a lower resolution or program scheduled recording times. Your cameras use cutting-edge HEVC (otherwise known as H.265) video compression capabilities to deliver significantly better video quality with similar file sizes as its predecessor H.264. This means that HEVC will keep the 2K video quality, but not the 2K file size. HEVC compression will also let you see the highest quality security footage on your smartphone or tablet without large data transfers. Use the NVR to customize the record settings on each of your cameras. There are three different options to choose from – continuous, scheduled, or motion. Motion recordings include a pre-recording function that will record the five seconds before the motion is even detected, ensuring you never miss a moment. The NR900 Series NVR has been designed to automatically update its firmware to the latest available version without you having to push a button. As long as the NVR is connected to the internet, you will receive automatic software updates and security patches free of charge. This ensures that your NVR is always up-to-date and protected from any new vulnerabilities.